Jackson called the performances a "final curtain call"
LONDON, England (CNN) -- Reclusive pop icon Michael Jackson will perform 10 concerts in London in July in what he described Thursday as a "final curtain call." Michael Jackson announces the London dates at the O2 Arena. The summer shows, Jackson's first major live performances in 12 years, will take place at the 20,000-capacity O2 Arena from July 8. 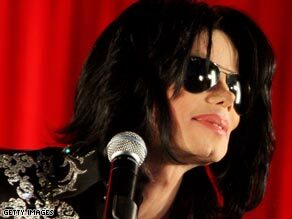 Jackson, 50, appeared in front of fans and media at the venue Thursday to announce the "This Is It" shows. "These will be my final shows performing in London. "This Is It" really means this is it," said Jackson, wearing a trademark black military-style jacket with sparkling embroidery and black sunglasses. Jackson blew kisses and saluted his fans as they chanted "Michael! Michael!" Tickets for the shows will cost £50-75 ($70-105) and will go on sale on March 13. Fans can pre-register to purchase tickets at www.MichaelJacksonLive.com. The O2 Arena has acquired a reputation in recent years for staging "must-see" musical events. In 2007 it hosted Led Zeppelin's one-off comeback gig as well as a 21-night residency by Prince. Britney Spears, the Pet Shop Boys and Lionel Richie are among performers due to play the venue this year. Event promoter Rob Hallett welcomed Jackson's return, saying: "We are delighted to facilitate the return of the king of pop, long may he reign! When Michael Jackson performs the eyes of the world will be watching." Jackson's appearance Thursday was not as slick as some of his signature dance moves. The star was held up in traffic as he traveled from his central London hotel to the venue on a peninsula of the River Thames in southeast London. An exclusive video that was to be shown before his arrival on stage then failed to play on cue. "I'm quite excited about him coming back," said Lee Gibson, 36. "He's got great songs despite all his issues. It's going to be massive." Owen Griffiths, 29, said: "It will be interesting to see what he does. If he puts on a good show like he used to do back in the day it will be a turning point for him just like it was for Prince here. If he's playing a greatest hits concert I would definitely pay £50 to see that --- so long as it's "Thriller" and "Off the Wall" only." Rumors of financial difficulties and health problems -- in 2008 he was photographed being pushed in a wheelchair -- have swirled around the famously eccentric star in recent years. Last year he sold his iconic Neverland ranch and he has spent much of his time since his acquittal living in Bahrain. Jackson hasn't recorded a studio album since "Invincible" -- his 10th solo record -- in 2001. His last major series of concerts was a world tour to promote the "HiStory" album in 1996 and 1997. "Thriller," released in 1982 and containing classic Jackson hits such as "Beat It," "Billie Jean" and the title track, is the best-selling album of all time. Jackson is estimated to have sold more than 750 million albums in total.